Police should look beyond the available intelligence and take a broader view of potential threats, a report into an attack on a car carrying the Prince of Wales and Duchess of Cornwall has said. "Important lessons have been learned" from the incident on the day of student fee demos, the home secretary told MPs. The car was attacked by protesters in London's West End on 9 December. Protection had to continue to take into account the Royal Family's desire to be seen by the public, the report said. Metropolitan Police Commissioner Sir Paul Stephenson ordered an internal review into the incident, which was presented to Theresa May in December. In a written statement to MPs, Mrs May said the details of its findings could not be released for security reasons but "the overarching recommendations relate to operational planning and the co-ordination of personal protection and public order policing". "The most significant area of learning from the incident is the need to look beyond the available intelligence to take a broader view of threats that can reasonably be anticipated in the circumstances, and to adapt plans accordingly," Mrs May's written statement said. While "important lessons have been learned from this shocking incident" she said the findings must be seen in the context of the provision of protection for the Royal Family that has an "enviable record over many years". She added: "Such protection always has to take into account the Royal Family's desire to be seen by and to be close to the public." The violence came on the day MPs voted to allow university tuition fees to rise to up to £9,000 per year in England. 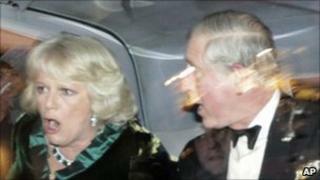 Several protesters launched an attack on the Royal couple's Rolls-Royce, during which "contact" was made with the duchess. The car was kicked, splashed with paint and a window was cracked to chants of "off with their heads." Scotland Yard has said no officers will face disciplinary action over the incident. Sir Paul praised officers for their "enormous restraint," suggesting those responsible for the damage to the car were lucky not to be shot. Prime Minister David Cameron condemned the violence and Scotland Yard said it had launched a "major criminal investigation" into student disorder between 10 November and 10 December. Police have released footage showing the moment a mob descended on the royal car, in the hope the images will help them identify those responsible for the attack.